Joined Ladies of Harley in 1989. I've been ridin' 15 plus years and I travel to as many rallies as possible. My choice was easy...I knew the owner at my local H-D dealership, so naturally it was "at cost". What ever that means:) No, not cheap, but it suited my needs for long trips. It wasn't my first and won't be my last..I update every 40,000 mile or so, but the plate stays the same: HRBGR : no, not hamburger... HER BAGGER. My bar-hoppin (don't drink) bike is a 49 degree raked chopped out H-D Deuce. Yes as you may have guessed : RDRNR...(road runner). Over the years I have had a Sportster (my youngest son now rides) Fat Boy (my other son rides), another Deuce (my daughter rides). My husband never road, just me & the kids. 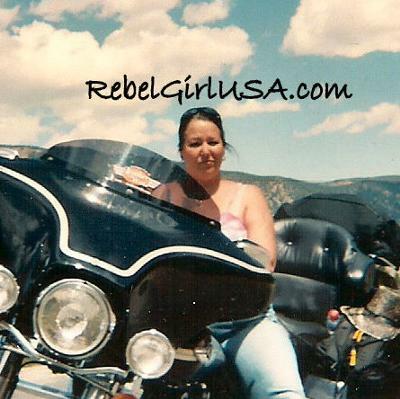 After losing my husband to cancer I knew I had to keep myself busy, so I started my own bike shop near Detroit, M/C Leather Works www.mcleatherworks.com and also started a Womens Motorcycle inspired Brand of Apparel, Accessories and Riding Gear called Rebel Girl. That is a NICE ride! My hubbies dream. He has a Heritage, I have a Sporty. Thanks for sharing your story. It's great you and your Kids share the joy. I have 4 kids, I don't think any of them are happy about me riding. I just started riding my own in Feb.
My youngest is 17, I worry about her worrying about me. But I explained it really makes me happy, and I am as careful as can be. I then printed off the poem "risk" and told her to remember this philosophy, you can't really live without taking risks, with your heart, mind and soul (and body :-) ). As you know, by the loss of your husband, life is short, live it to the fullest. P.S. You all can Google, poem "risk" and read, it is cool.